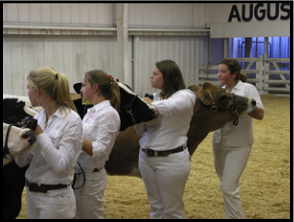 In the Livestock Barn, the animals are fed and groomed for the competition. The youth of the CSRA who compete here take care of their animals as you can see here. As you can see here, competition is keen as they show their animals. 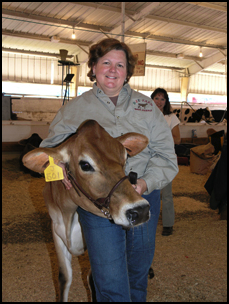 Keeping the animal content during the competition requires constant attention to detail, while making sure the animal stays under control, especially while the judge is watching. These young ladies were all awarded ribbons for their efforts. The Blue Ribbon went to Miss Elizabeth Holmes, on the far right in this picture. Owning a beautiful animal is not enough; loving the animal and knowing about the animal is critical. 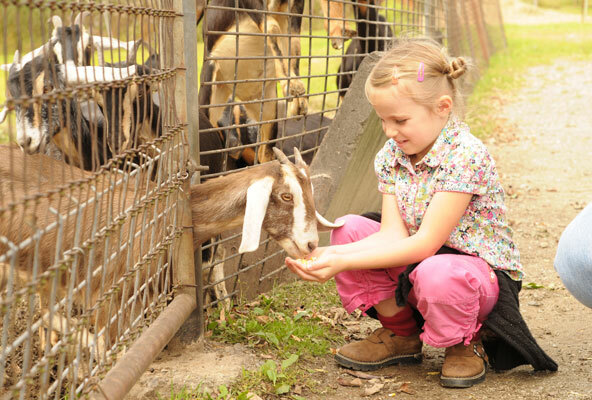 When a boy or girl shows an animal, it becomes apparent to the judge very quickly that the child and the animal know, love, and respect each other. When they get along with each other, showmanship is a lot easier. Look closely at this picture and you will see a caring child and a calm heifer. It pays off in the long run. This proud lady, Karaleigh Holmes, had just had the privilege of seeing her daughter Elizabeth win the Senior Showmanship Award, after a long session in the arena. She then went into the arena herself and took the Blue Ribbon in the Mothers’ Walk.